Head Hand & Heart: HELLO! Welcome to Head Hand & Heart! 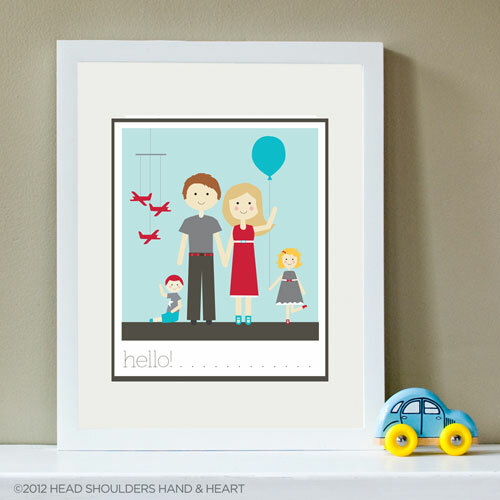 Modern, Folksy and Fun Custom Portraits for every age! Ever since the birth of her daughter in 2009, Christina has been dreaming up stories and characters for children's books. While sketching out a story inspired by her little girl, the clothespin people of Head Hand & Heart were born. Christina started creating these custom portraits as gifts for friends and family and as word spread she decided to create a shop and open her doors to fun-loving people everywhere. Each portrait is created with love by award-winning graphic designer and illustrator, Christina Flowers, from her studio nestled in the Shenandoah Valley.